The cameras built in to today's smartphones are pretty darn good. I've been especially impressed with the iPhone 6 camera, and some of the Android phones even let you capture RAW format photos. While they're not a direct replacement for a good DSLR in terms of control, flexibility, and image quality, the images the current generation of smartphones put out are as good, often better, than most of the compact cameras on the market even just a few years ago. And you have the added advantages of being able to do some pretty complex enhancing directly in the phone. And, of course, their killer feature is that you have your phone with you all the time. Smartphone cameras do have their limitations, but there are ways to play to their strengths. 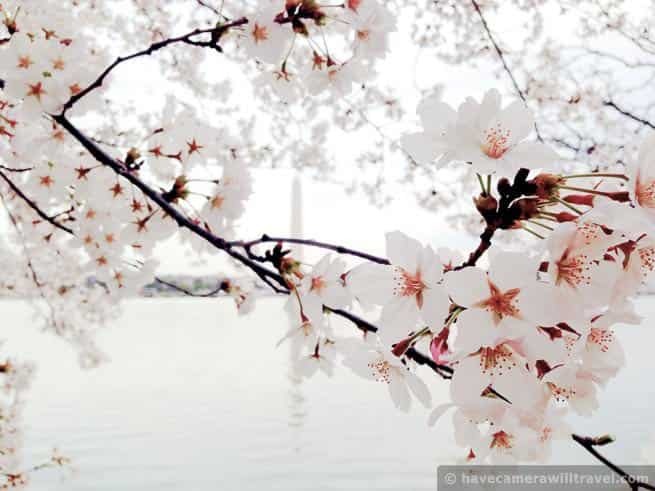 Here are some tips that will help you play to those strengths and avoid some of the weaknesses so that you end up with some beautiful photos of the cherry blossoms. Wide landscape photos taken from far away can often end up being disappointing with a smartphone camera. Some of that's because of the lenses. Some of it's because of the sensors. And some of it's due to other technical limitations. But smartphone cameras do generally work well up close where you can make something the dominant part of the image. For the cherry blossoms, that's a definite strength. It means that you can get up close to bring out the details of these beautiful flowers. That's not to say you can't make the most of the beautiful monuments, skies, and water of the Tidal Basin. But having some flowers up close in the foreground can help make for a more interesting photo. If you want to get in really close, you can get snap-on macro lenses for smartphones like this one. Spend your time at the Tidal Basin taking photos, not sorting them, deleting them, applying filters to them, or emailing them to all your friends. You can do all that stuff after while sitting at a coffee shop or on the Metro. You want to make the most of your time to capture the best photos you can. Whether it's the moment, the light, or the cherry blossoms themselves, it's a fleeting spectacle. Filters like the ones on Instagram can help turn an otherwise bland photo into something more visually interesting. But there can be too much of a good thing. The cherry blossoms themselves--not to mention the Tidal Basin and its monuments--don't need much help being beautiful. The built in camera controls on your phone aren't bad, but there are ways to make them much better. There are apps that offer much better creative control, including being able to specify where to focus, where to take the exposure settings from, and a host of other tweaks. I've found Camera+ on the iPhone and Vignette on Android. Neither is free, but in my experience they're well worth it. A smart phone camera can go places a big DSLR can't. Or rather, it can go places more easily than a big DSLR can. Put that to use. Being creative with your compositions can make for more interesting photos. The horizon does not always have to be in the middle of the frame, and you don't have to always take people photos from standing directly in front at eye level. Try shooting up. Try shooting down. Try shooting at an angle. Most smartphones also have a panorama feature which can give some wonderful results. Go wild--you can always delete experiments that don't work. One of the weaknesses of camera phones is that their sensors don't do well with high contrast. In technical jargon, it's call dynamic range. What it boils down to is that if what you're taking photos of has both very bright areas and very dark areas, something's got to give. Soft light can be a good thing. If you take close-up photos of the cherry blossoms in harsh mid-day sunlight, you'll probably end up with blown highlights and washed out colors. Particularly for close-ups, even light is probably going to work best. Cloudy and drizzly days are common in Washington's early spring, but don't necessarily write off clouds as a bad thing. Because they even out the light, they can actually be a good thing in trying to get photos of the cherry blossoms. If the sun is out, the solution is not just as simple as shooting in the shade. That can work, but you still want to make sure that any bright sunshine in the background of your shot isn't going to pose a problem. And if your phone has an HDR option like the iPhone does, that can make a big difference. What it does is capture three photos at different exposures and then blends them automatically in order to capture details from both highlights and shadows. On an iPhone you turn HDR mode on in the camera app by clicking on the HDR OFF link at the top of the screen. If you're using IOS 8, either HDR Auto or HDR On works well. And you can control whether or not to keep just the final, blended photo or keep both the blended photos and the regularly exposed photo by going to Settings > Photos & Camera > Keep Normal Photo. When you look at your smartphone screen you're seeing the composition of the photo. That toddler throwing a tantrum in the bottom right corner of your screen? He'll still be there in the photo. So while you're composing the shot, take a split second to make sure the background is how you want it. You're not trying to hit a hole in one. No-one is keeping score. If you go in with preconceived expectations, there's a good chance you'll be disappointed. The weather isn't always going to cooperate. The Tidal Basin is not always glassy to create those reflections. The ducks are not going to listen to your imploring directions. The blossoms might not going to sit still in the breeze. It's not always possible to avoid getting people in the shot. By all means, start with a plan. But be willing to adapt it to what's in front of you. You'll end up with better photos and, more importantly, you'll enjoy it more. Your favorite photo, when all is said and done, will almost certainly be one you didn't expect. If you have your face buried in your smartphone's screen the whole time (or any camera, for that matter), you'll have only a very narrow field of vision. And it means you won't see another great photo that might be right next to you, if only you'd seen it. So take time to smell the cherry blossoms. If you're looking to expand your phone's lens options, snap-on lenses like the olloclip or ExoLens can add things like wide-angle, macro, or telephoto options.